We recently bought a lightweight hunter called Ballyduane King, when he came to live with us he was very fussy eater. He would hide at the back of his stable at feed time and showed no interest in the food at all, if we were lucky he might nibble on some hay. His eating habits concerned us greatly and we tried but failed to get him interested in his feed, we were at a loss, we tried several different feeds to tempt him but nothing seemed to tickle his fancy. Ballyduane King is of sharp mind, he’s not crazy but he’s feisty and he knows what he wants, trying to find a feed that he liked and that wouldn’t make him hot headed was becoming a challenge. When we tried Emerald Green Feeds, BINGO we found something that he would eat, he not only eats it but as soon as he hears the feed buckets rattle he’s kicking the door to get to his feed, he’s gone from a horse that won’t touch anything to horse that now eats three meals a day. He has the Alfalfa and the Grass mixed together and it has made a massive difference to him, he looks fantastic, his coat is glossy, his condition has improved and best of all he’s kept his sharp brain without getting hot headed. 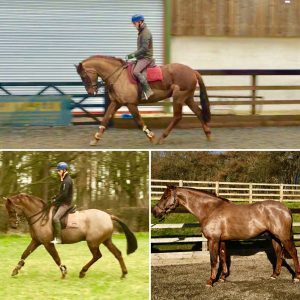 We’re really pleased with the result feeding EGF has given not just Ballyduane King but all of our show horses.